"OK, so here's the problem," Ali Parmelee began. "Most companies use Facebook Ads with a singular focus and think, 'I have this one sale, I have this one event, I have this one week that I need to promote, and that is all I'm going to do.' It is one of the most common mistakes I see made with Facebook Ads." I've heard Ali say this a few times before. Once during our last interview on 2019 Facebook Ad strategies and at IMPACT Live last year during her talk. While I have always understood at a surface level that, yeah, that sounds like a bad thing, I've never really understood why. What's the Problem with One-Off Facebook Ad Strategies? "Well, the biggest issue is that it's not going to be as cost effective and budget-friendly long-term," Ali says. "Facebook ads should be part of your actual digital marketing strategy. Sure, you might see some results if you were to start out immediately advertising a sale or something else on Facebook, but it's kind of like dating, you know? You can't just show up to that first dinner and say, 'Hey, marry me!'" In other words, when inbound marketers sit down to create Facebook Ads, they usually throw all of the inbound principles they understand and embrace otherwise -- nurturing, educating, etc. -- completely out the window. They go straight for the hard sell. In some cases, that may be effective and you'll see some traction. But, for the most part, it will never be as effective as investing what Ali calls a full-funnel Facebook Ads strategy. 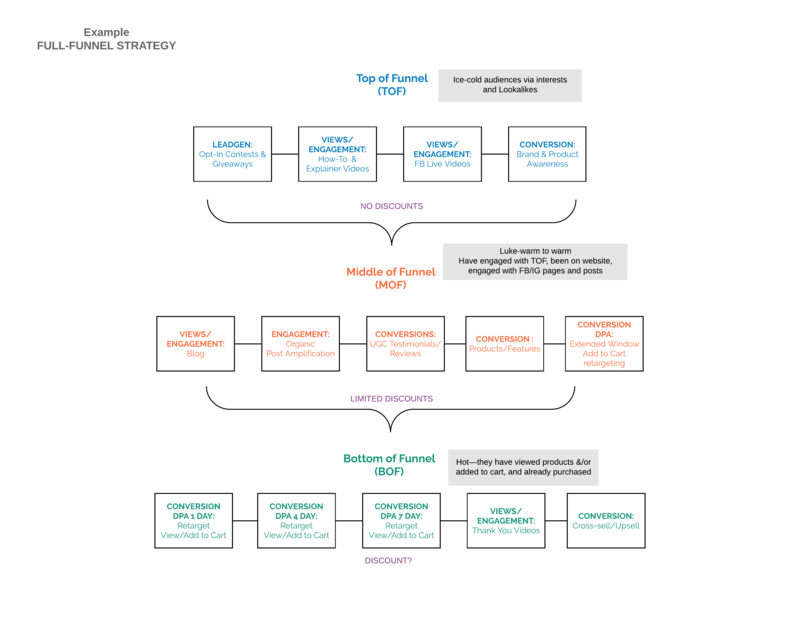 According to Ali, a full-funnel Facebook strategy follows the buyer's journey. Through the strategic paid promotion of different types of content on Facebook, you can attract net new people at the top of the funnel who are ice cold and nurture them through the purchasing process -- awareness, consideration, and -- finally -- decision. You can also retarget people who are aware of your brand and need to reconvert. "So, a quick example would be creating Facebook Ads around explainer videos or how-to videos; top-of-the-funnel content to get people engaged -- they start watching and clicking, interacting with your brand for the first time," says Ali. "Then we go into the middle of the funnel, and so on." What Does a Full-Funnel Facebook Ad Strategy Look Like? "At the top of the funnel, we love to do contests and giveaways," Ali notes. "Again, here, we're focusing on attracting net new people. We find that even something as simple as a $250 gift card can attract a ton of new people. In our experience, the amount of people who opt-in for something like that is insane -- in the thousands." "Facebook Live videos are another great educational option for top-of-the-funnel Facebook Ads," she says. "Then, I'll create middle-of-the-funnel retargeting Facebook Ads which retarget those who have watched at least between 50 and 75 percent of that more long-form video." But this only works well for marketers if they understand what a Facebook Pixel is and how to use it correctly. The Facebook Pixel is simply a snippet of code that gets installed on your website, which tracks people who come through to your website from your Facebook Ads. "They'll say, 'OK, I installed my pixel. Let's go get some lunch!' But what they don't do is make sure their standard events are triggering." Standard events include viewing a piece of content, adding a product to a cart, initiating checkout, etc., which allows you to use that intelligence for retargeting Facebook Ads. In short, it's the reason why when I go to OldNavy.com and add a sweater to my cart, but then don't complete the purchase -- because I remember we're about to buy a house and I'm supposed to be on a shopping ban -- that it follows me around like a ghost haunting me in Facebook Ads. Of course, I'm weak, so I usually end up buying the sweater. So, the reason why we have the full-funnel strategy in place -- especially why you do that top of the funnel grab is to get as many people on your website as possible -- is to understand the behavior of your buyers, record it, and then leverage that intelligence to move people through your funnel to an eventual purchase. Your full-funnel Facebook Ads strategy goes beyond the people who visit your website. 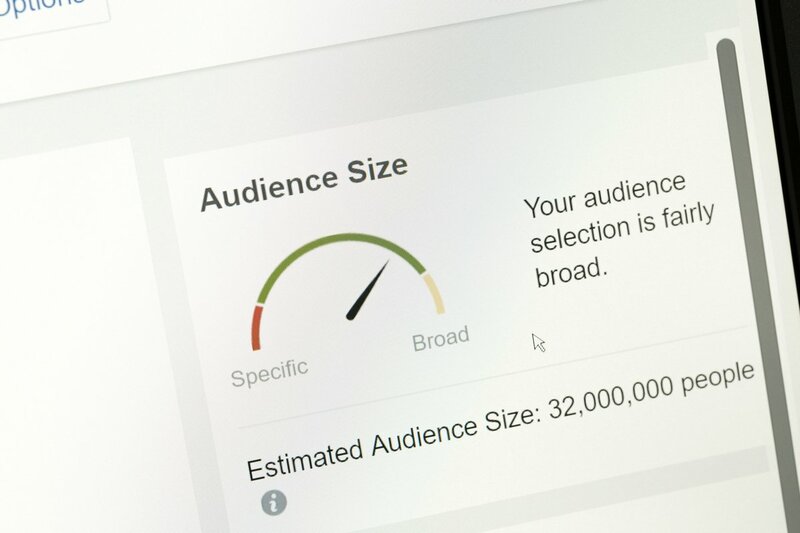 According to Ali, she can actually create "lookalike audiences" that mirror the behaviors, interests, and other markers of the most interactive and high-activity audiences for brands and target them through more middle-of-the-funnel ads. "We work with a company that sells sun protection bathing suits and coverups," Ali shares as an example. "So, we have a behavior audience that's all about skin cancer and dermatology, where it's a concern for them, and they're more apt to follow those sort of things and seek out those types of products." What Can You Do Right Now to Embrace a More Full-Funnel Mentality with Your Facebook Ads? Ali says, "Think about your sales journey. If you have somebody who's brand new to your brand, what is it going to take to make them feel comfortable and confident to want to purchase your product, to want to actually convert with you?" That's what you need to think about when you're explaining your brand and your products or services through your Facebook Ads. What credentialing do you have to do to make your potential buyers feel comfortable? That makes them feel confident and trust you? "That's what this all comes down to," she continues. "When I'm creating Facebook Ad strategies for our clients, it's about bringing awareness at the top of the funnel, bringing them into the middle of the funnel after that trust has been established, and then, finally, the bottom of the funnel. Yes, you can make money with a more fractured approach, but full-funnel is the pathway to long-term success with Facebook Ads and remarkable revenue returns."